Having a positive relationships with birth parents creates a nurturing environment for your child to grow. Many birth parents choose to stay in contact with their birth children and adoptive families in what is known as an open adoption. Open adoptions can be very rewarding for everyone involved. The birth parents may have to overcome a lot of emotions at the beginning of the adoption. However, as time goes on, birth parents and adoptive parents can show support for each other to heal the pain of loss. What results is a positive and affirming relationship where birth parents and adoptive parents work in unity to create a healthy foundation for their child. Here are a few ways you can work towards that positive relationship. Communication is key to any good relationship. If you liked or disliked a certain way that the birth parents interacted with your family, or vice versa, be sure to let them know! Discuss how, where, and when the next meeting should be. Being open about your feelings is a great way to build a better relationship for the future. A great way for parents to support each other is to point out shared traits. For example, adoptive parents can point out how their child shares the same physical traits, talents, and personality as the birth parents. Birth parents can point out how their child shares the same mannerisms, values, or hobbies as the adoptive parents. As a birth parent, you can complement the adoptive parents on what a good job they’re doing as parents. This is not only good for your relationship with each other, it’s also affirming for your child to witness the positive relationship between their birth parents and adoptive parents. The average age of birth parents is 23 years old. With this in mind, it’s helpful for adoptive parents to practice extra patience and persistence when they do not receive phone calls or letters they are expecting. Take the initiative to keep the relationship lively and up-to-date. Even if you aren’t receiving the same frequency of communication as you’d like, keeping the relationship going will be very meaningful and positive for your child. 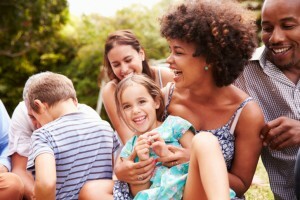 By communicating frequently, you are also letting the birth parents know that their hopes and dreams for their child are being realized. This entry was posted on Tuesday, April 26th, 2016	at 4:08 pm	. You can follow any responses to this entry through the RSS 2.0	feed. Both comments and pings are currently closed.